Google released the Android 7 Nougat for the Nexus devices and most the developer also released the custom ROM based on the Android 7 Nougat build. Android 7 latest version of the Android and Nexus are first devices which get the OTA update of this new official update. The new Android update comes with lots of features and fixes which Nexus users are enjoying on their phones. Other phones like Oneplus, Sony, Moto, Xiaomi, etc. that haven’t officially received the update can install the Custom ROMs based on the Android 7 Nougat. But now the question is how to root the Android phone running on the latest Android 7 Nougat. And the answer is that you can root Android 7 Nougat without a computer. 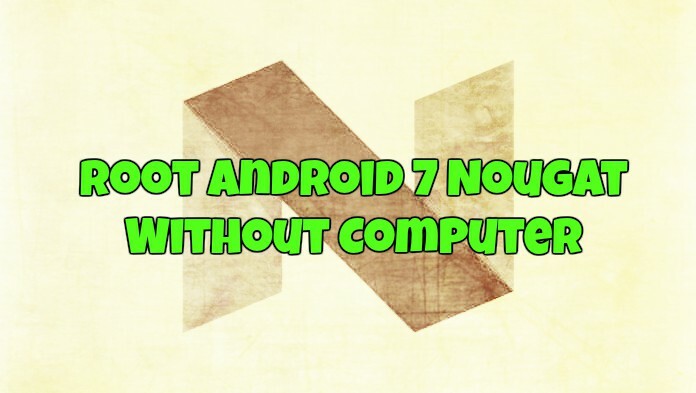 No need to run any rooting application on your Windows PC to root Android 7 powered phone. All credit goes to developer Chainfire, who released the new stable version of SuperSU zip file for the Android 7 Nougat devices. If you are advanced Android user, then you are aware of the SuperSU zip file. A file which allows you to get the roots access on your Android phone. To root your Android 7, Nougat powered phone all you need a custom recovery (TWRP or CWM), and you are ready to go. As we mention above to flash the Super SU zip file, you need a custom Recovery. So first search for the TWRP or CWM recovery for your device and flash the same on your phone. After that follow the below mention steps. 1. Visit this link on your mobile and download the SuperSu zip file. And remember the location of the file where the file saved. 3. Now once you are in recovery mode. Tap on the install button and Select the SuperSu zip file that you downloaded don your phone. 4. Swipe to flash. Or Tap to flash the SuperSu zip file. 5. Once completed. Go back to the home of Recovery and Reboot System. Now your phone will boot, and you will see the supersu app icon on your phone. That is it! Enjoy root access on your Android 7.0 Nougat phone. Rooting Will not wipe data. Only Unlocking Bootloader and Flashin ROM will remove the data. Can the Verizon Moto Z Force be rooted this way with a locked bootloader? Will this work with Verizon Google pixel xl?